There seems to have been a bit of a trend in recent years for quality science fiction, or more literally quality space travel movies. I think it began with Doug Jones’ acclaimed ‘Moon’ and then followed through with Gravity and then Interstellar. Hollywood seems to have fallen in love with the great vastness of space again, and I have fallen in love along with them. So this latest effort was high on my must see list. Matt Damon plays astronaut Mark Watney who following an expedition to Mars, is left unknowingly behind by his crew following a freak sand storm. 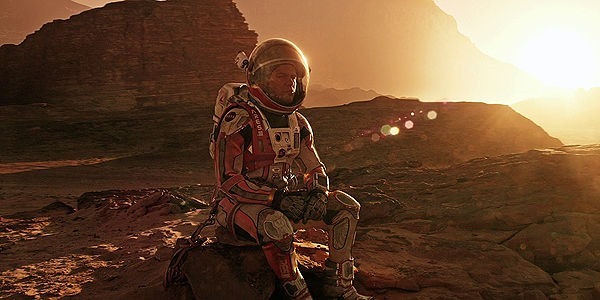 With everyone thinking he is dead and a memorial back home, Watney has to learn how to survive on an alien planet until he can find out a way of communicating and hopefully getting rescued. Based on the book by Andy Wier and directed by genre heavy-weight Ridley Scott, this is a gripping concept as we watch Damon put all his scientific knowhow to the test and learn to adapt to a harsh environment. Back home Nasa and its myriad of boffins are also trying to figure out a way to save their man, headed by Jeff Daniels and supported by Kristina Wiig and Sean Bean amongst various other familiar faces. Oh and the crew that left Watney behind get the always watchable Jessica Chastian as their commander. It’s clear to me this was a bit of a labour of love and is choc-full of detail and science terminology (even days are referred to a sol 1 and sol 2 etc). Yet beyond some of the realism and authenticity the movie also finds room for well judged humour. We also get a strongly potent emotional thread that builds and gets pretty heart-breaking. Everyone here is on very good form but it’s obviously Damon’s show and he is simply superb…charismatic in the face of adversity and also very believable. He’d have been my tip for Best Actor at the Oscars but sadly it wasn’t to be. 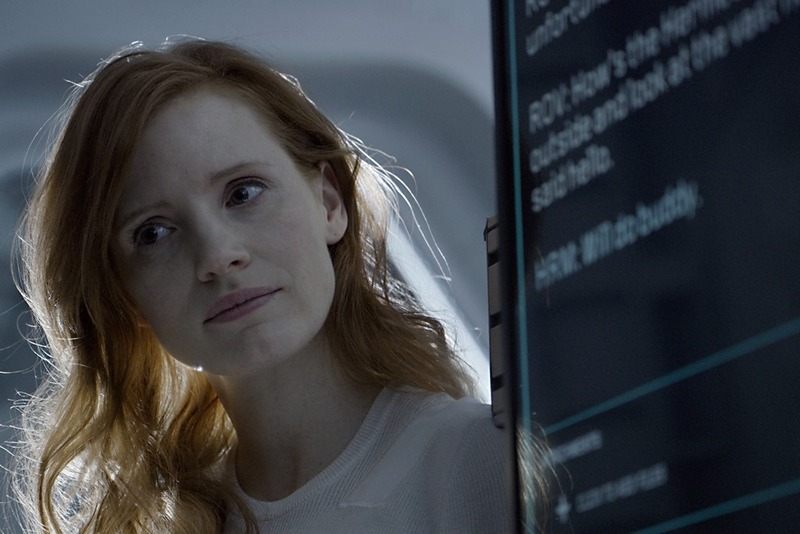 In addition to such a solid, layered performance however is excellent direction from Scott, who aided by cinematographer Dariusz Wolski, proves again he’s a master at capturing the perfect look and feel for Science Fiction, and redeems himself after the muddled Prometheus. Some of the shots and vistas and photography here are jaw-dropping. Honestly, there is very little I can say negative about this one apart from hey, where were Mark Watney’s parents?? And the first act is a trifle slow, but that’s some serious nit-picking. If you are fascinated by space travel or are just attracted to decent human survival dramas, not unlike The Revenant I’ll add … then you have to see this. This entry was posted in Blu-Ray, Drama Reviews, Movies, Reviews, Sci Fi / Fantasy Reviews and tagged Jeff Daniels, Jessica Chastain, Kristina Wiig, Mars, Matt Damon, NASA, Ridley Scott, Space, Space Travel, The Martian by Craig M. Bookmark the permalink. Good review Craig. It’s so entertaining and fun, that you almost forget it’s basically a tribute to NASA. Agreed but I don’t see that as a negative and they were actively involved with the movie for authenticity it seems. I liked this but nowhere near as much as the book. I hear the book is very good. Thanks for stopping by.